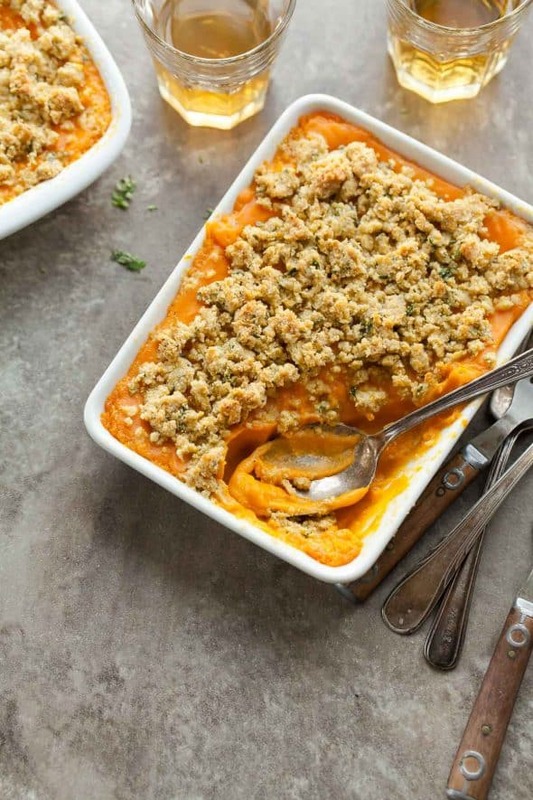 This thyme scented paleo and vegan sweet potato and butternut squash gratin is a savory alternative to the usual sweet potato casserole this holiday season. While it might be a bit old fashioned, I still love the idea of a casserole when the temperatures starts to drop. 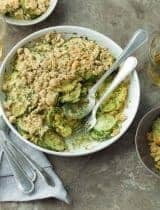 Especially around the holidays when time is short and there are lots of hungry mouths to feed, a warming casserole is always an easy and dependable addition to the table. 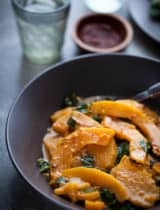 This make-ahead sweet potato and butternut squash gratin is one of my go-to’s when I’m putting together my holiday menu. 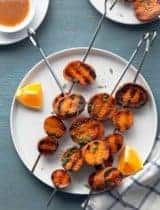 Yes it’s technically a sweet potato casserole, but it’s nothing like those sticky sweet marshmallow ones we’ve all come to associate with the holidays. This warm and soothing casserole is a savory affair, no sugar or maple syrup or marshmallows in sight. 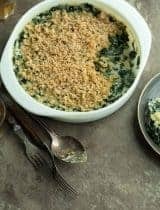 It’s made gratin-style, which is simply the term for topping a dish with bread crumbs and/or cheese (or a mix) and baking until browned and crisp. 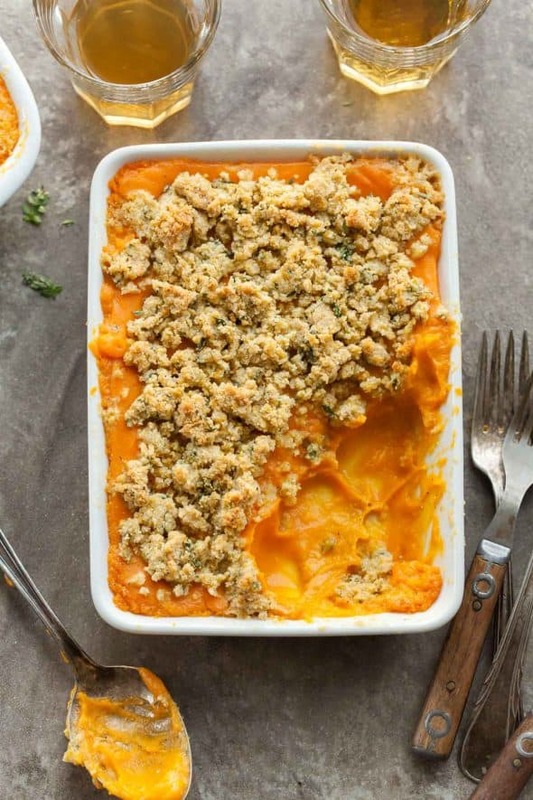 And while traditional gratins are typically made with lots of cream, butter, cheese; this one relies on the inherent silkiness of sweet potatoes and butternut squash, along with a dollop of dairy-free coconut yogurt for extra creaminess and a simple almond and nutritional yeast based breadcrumb topping to deliver all the same satisfying richness. 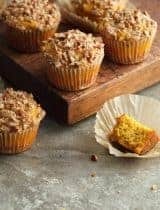 Roasted sweet potatoes and butternut squash are blended together to create a purée, that’s then layered with the olive oil and thyme scented “breadcrumb” topping and baked until golden and bubbly. 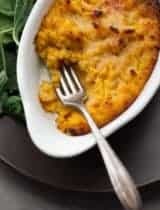 The result is a luxurious silky mash with an irresistibly salty, savory, “cheesy”, crisp crust. 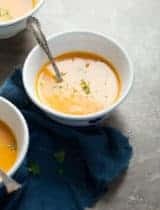 Both the purée and topping can be made the day before and just popped in the oven at the last minute, making it a natural for the holiday table or any harried weeknight meal. 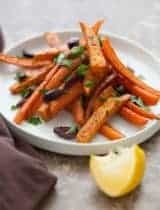 It’s s a tasty, savory way to enjoy your sweet potatoes this season. 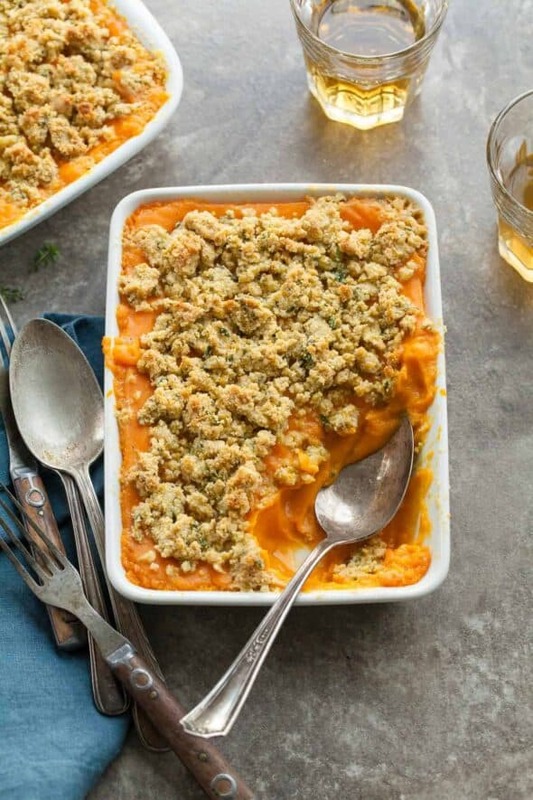 This thyme scented sweet potato and butternut squash gratin is a savory alternative to the usual sweet potato casserole this holiday season. Heat oven to 400 degrees. Grease a 1 to 1 1/2 quart gratin dish with olive oil and rub with cut garlic clove, set aside. Place sweet potatoes on a baking sheet and bake for 45 minutes to an hour or until tender when pierced with a knife. Rub cut butternut squash with olive oil and sprinkle with salt and pepper. Place butternut squash cut side down on a separate baking sheet. Bake for 45 minutes to an hour or until tender when pierced with a knife. Combine topping ingredients in a bowl, set aside. Transfer sweet potato and pumpkin mixture to prepared dish, sprinkle “breadcrumb” topping over gratin. Transfer gratin dish to oven, and bake for about 20-25 minutes, or until topping is golden. Remove from oven and serve warm.